This favorite summer salad is so flavorful you’ll be going back to it again and again. I use the least expensive salmon I can find – as long as it is fresh and sweet. I’ve never tried this with canned salmon – I fear that would be too salty. But good farm-raised salmon can be had for about $6/pound on sale and a pound makes a dozen cakes, enough for six servings. The salad itself combines mesclun or baby greens with fresh herbs for a summery, intensely flavored final result. Adrienne demoed this recipe for a class at Brookside June 17, 2014. Adapted from Cuisine at Home. Whisk all ingredients together for the vinaigrette and reserve. Combine salmon, 2 cups panko, scallions, and cilantro in a large bowl. In a second bowl, whisk together the eggs, 3 T lime juice, 3 T soy sauce, rice vinegar, 2 T minced ginger, jalapeno, 1 T sugar, and salt. Pour over salmon mixture and mix gently to combine. Form cakes with a 1/4-cup measure, then transfer to a baking sheet that’s been covered with 1 cup panko crumbs and sesame seed. Gently press cakes into crumbs and sprinkle with more crumbs on top. Chill cakes for at least 1 hour before frying. Heat oil in a large skillet over medium-high. Add cakes (cook in batches so as not to crowd the pan) and sauté until golden on one side, about 3 to 4 minutes. Carefully flip over and cook another 3 to 4 minutes. Place on paper towels and keep warm in oven. Repeat with remaining cakes and additional oil if necessary. Toss greens with the herbs and half the vinaigrette. 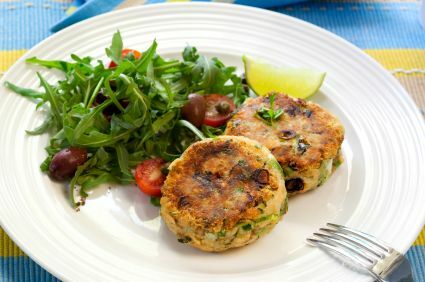 Arrange greens on plates, top with salmon cakes, drizzle with remaining vinaigrette and serve. This entry was posted in Main Courses, Recipes from Adrienne's pantry, Salads and tagged basil, cilantro, fish, ginger, lime, mesclun, mint, panko, salad, salmon, scallions, seafood, sesame, soy sauce. Bookmark the permalink.